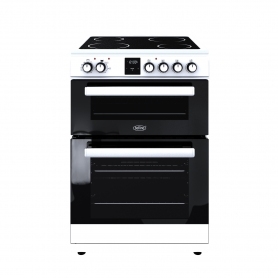 The Beko EDC633K freestanding cooker has a roomy capacity, with two ovens and a ceramic hob for ultimate flexibility. 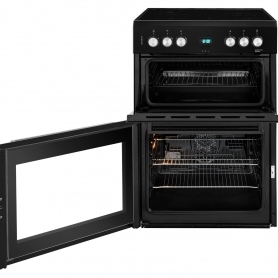 With useful features like hot hob warning lights and easy clean doors, you’ll be onto a winner with this fantastic model. 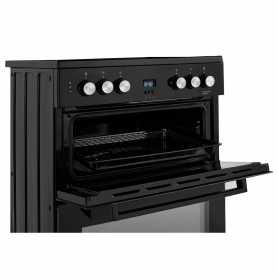 This cooker offers great flexibility when cooking your family meals, as the main oven has a large 69 L gross capacity, with two shelves. Whether you’re cooking the goose on Christmas morning or baking some cupcakes with the kids, the EDC633K shelves can be adjusted according to your needs. The top oven has a 36 L capacity and a grill, so you can make the perfect cheese on toast in no time, just the way you like it. To ensure perfect results every time, the Fan Air Heating System delivers fast and even heat distribution throughout the main cavity, meaning the oven heats up speedily, resulting in faster cooking times. 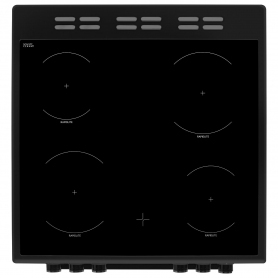 The electric ceramic hob has four Rapidlite zones, which deliver quick and efficient pan heating. The hot hob warning lights are ideal for the safety conscious, as they remain lit until the hob surface is safe to touch. 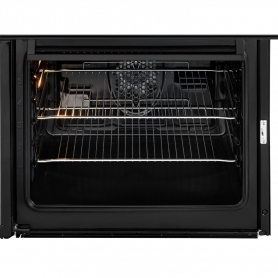 Both the top and the main oven have an easy-clean enamel lining, so you can always keep your oven hygienic and free from burnt on food residue. The edge to edge inner door glass can also be removed when you fancy giving your appliance a deep clean. The main oven has an interior light, so you can check on your food through the glass door, without having to let any heat out during cooking. 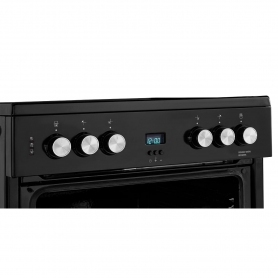 To make monitoring the progress of your cooking easier still, the main oven has a digital clock with a countdown timer. This means you can keep track of your cooking times at a glance, without the guesswork. The EDC633K even has an A energy rating for both the main and top oven, so you can do your bit for the environment and save money on your bills with every use. 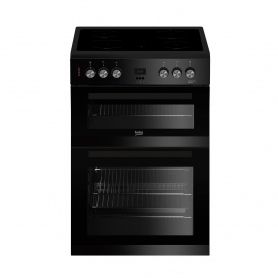 The sleek black design will look chic in any kitchen interior – add the Beko EDC633K to your basket today, to enjoy flexible cooking at its best.